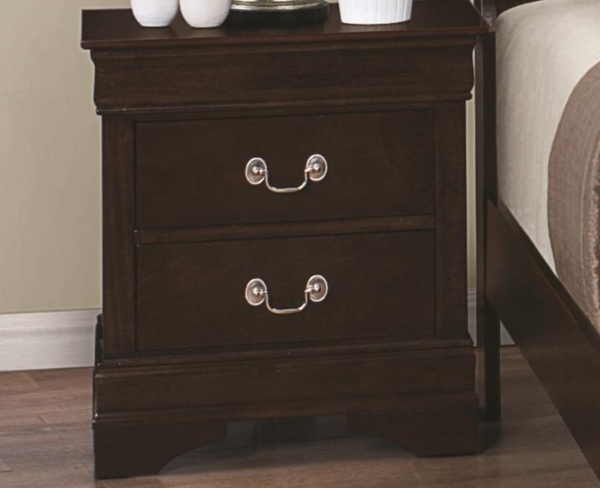 Accent your bedroom with this charming nightstand. Crafted from select hardwoods and veneers, it features a rich cappuccino finish to warm your bedroom. Two drawers provide convenient bedside space for items like glasses, reading materials, and more. Each drawer is decorated with a silver bail handle and metal on metal glides ensure easy opening and closing of the drawers. Recall luxury without abandoning practicality with this lovely nightstand.